Idris SamiIdris Sami: banned by Google. 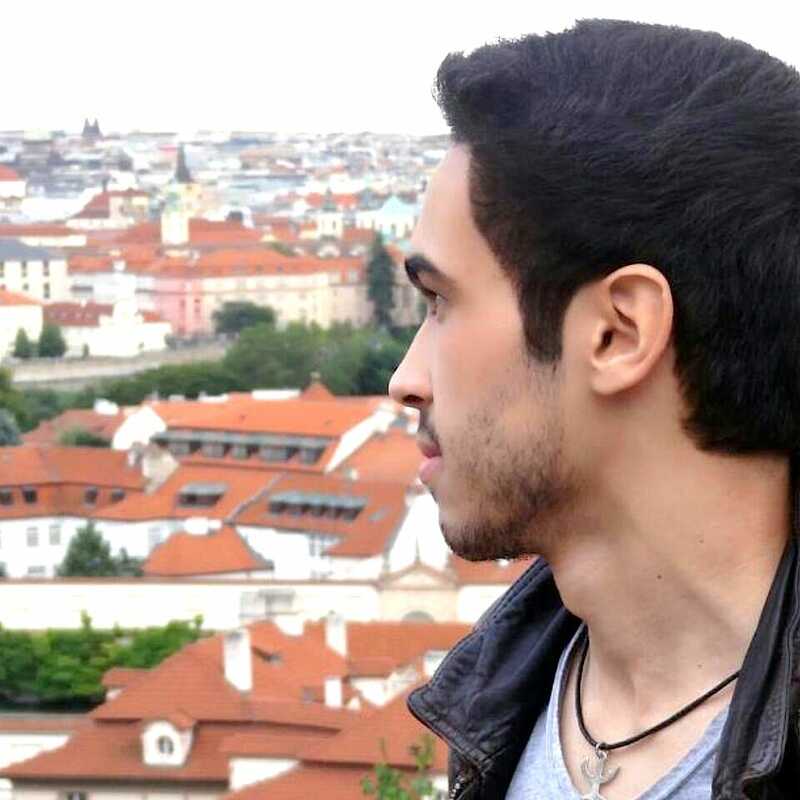 Idris Sami is a 19-year-old French-Moroccan entrepreneur who set up a website that lets people text their friends for free. Don’t have a phone, or want to avoid mobile data charges? No problem. MesTextos lets French-speakers text their friends from the website. MesTextos isn’t going to threaten WhatsApp anytime soon, but in Europe and the Middle East, where alternative messaging services are more popular, free texting is a nice little niche to occupy. 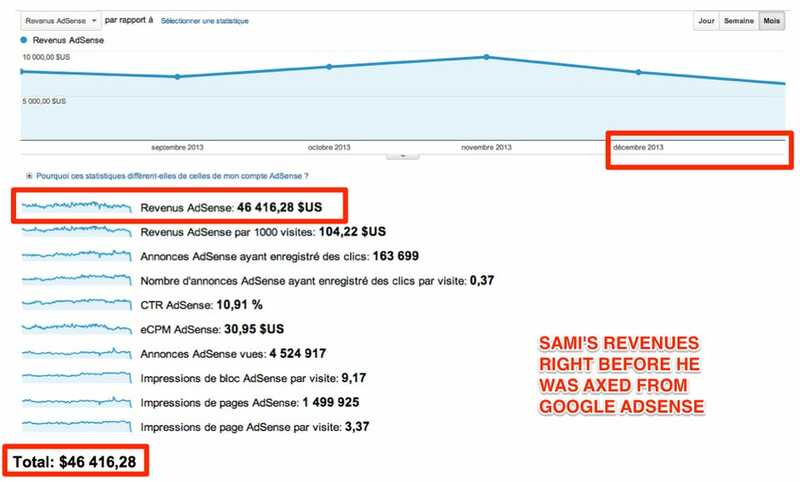 Sami was running Google’s AdSense advertising system on his site. It allows web site publishers to display search ads powered by Google, and thereby take a cut of the revenues. By December 2013 so many people were clicking on MesTextos’ ads that Sami’s Google account hit $US46,000. But then he learned that if you’re an AdSense partner and you don’t run ads on your site exactly the way Google wants, the search giant will punish you. 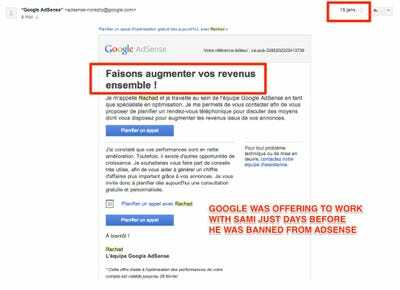 Google cancelled his account and returned all the money he had earned to his advertisers. He is banned from Google’s ad programs until further notice. Sami is furious about the money he earned and then lost. Although this is an extreme example — a huge portion of Google’s client base consists of individual publishers making only a few hundred dollars a month — it does typify one of the frustrations Google’s own clients have dealing with Google. Google is currently being sued in the U.S. over allegations that it suddenly and without explanation withholds ad money from website publishers once their sites become successful. And the company is the subject of an infamous, and obviously fake, conspiracy theory that any publisher who makes $US5,000 or more per month is banned from the system right before their checks are paid. (The theory has a giant hole in it — Google only collects revenues when it delivers those ads, so banning successful sites would actually make Google poorer.) This theory has been making the rounds for years. 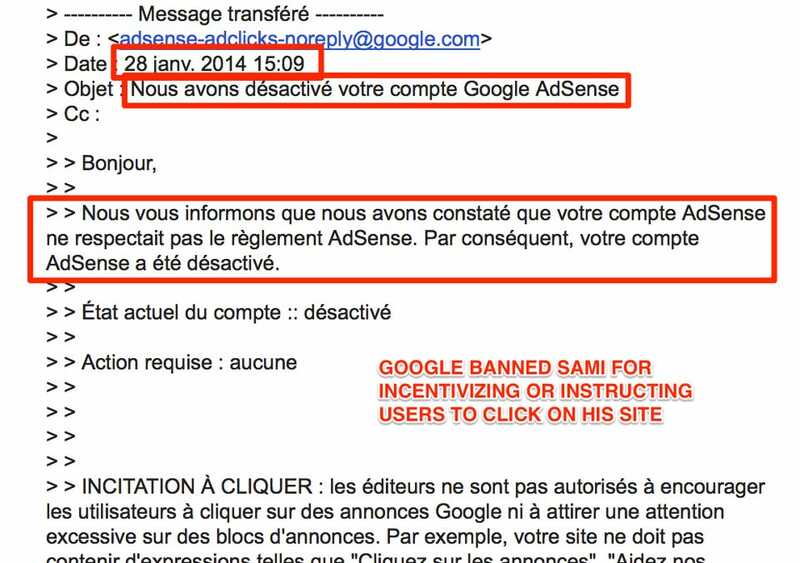 In an email Google sent to Sami, Google claims MesTextos was incentivizing or forcing people to click on ads in order to use the site, which is against the rules; Sami denies that. He says two different Google sales staff praised his revenue-generating efforts and, in separate emails, offered to help optimise his site to improve its performance. He says he wasn’t warned there was something wrong with his site until it was too late. … we always send a note to the publisher explaining which policy was in question and, in many cases, give them a chance to make changes to their pages to keep the account in good standing. Publishers are also given an opportunity to appeal policy decisions. Idris Sami / BI… and wanted to help him make more money just days before cutting him off. 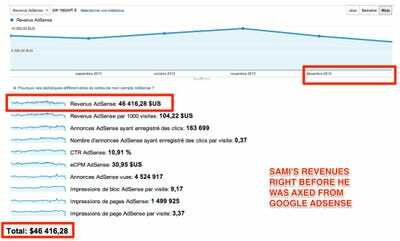 The issue is further complicated because, Sami says, Google’s ad rules in French are slightly different from the ones published in English. 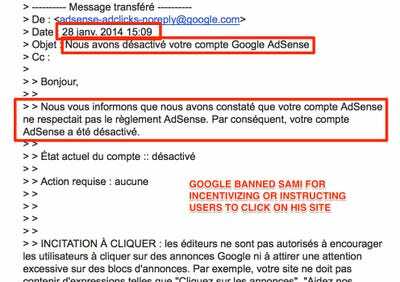 The ban feels galling to Sami because it came on Jan. 28, 2014, just 13 days after he received an email from Google offering to help him boost his revenues. “I later spoke again with the Team and was told everything was good,” Sami tells Business Insider. Google’s sales staff and its AdSense compliance people don’t necessarily coordinate, of course. The next email, on Jan. 15, 2014, was in French, and looks like a form letter generated for clients who achieve certain revenue goals. Idris Sami… And then Sami was banned from the system. Sami says he begged and pleaded with Google, but he cannot figure out what Google thinks is wrong with his site. On the one hand it’s a straightforward case: Google publishes its rules, and Sami allegedly broke them. 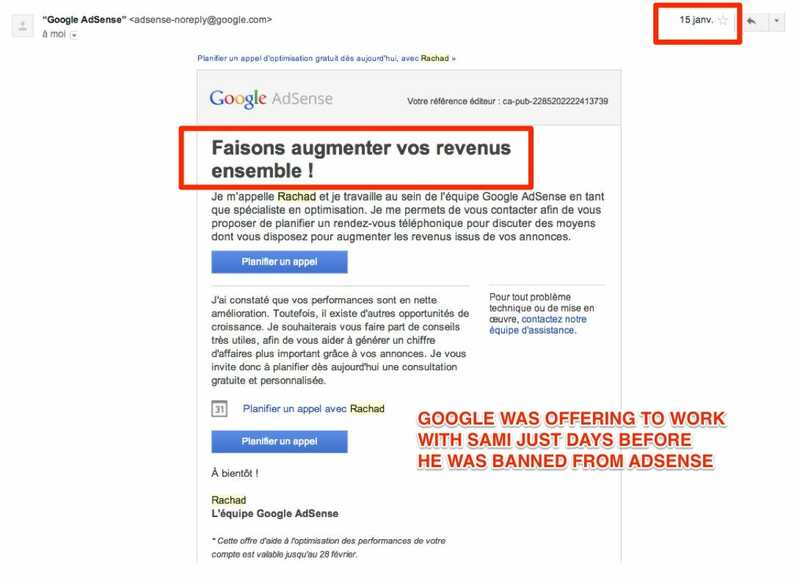 But, as we’ve noted before, Google has a PR problem here: AdSense can be complicated. The basic rules are 2,500 words long. It’s a fairly nontransparent company, and it doesn’t break down where its ad revenue comes from in any detail. And because it is so massive, and so many companies in the online ad ecosystem are entirely dependent on it, Google becomes a ripe target for rumours and complaints. Google is also constrained in explaining publicly how it detects bad behaviour and click fraud on the web because doing so would help those creating the fraud. So its bans often feel secretive or arbitrary to publishers. Publishers may not even know that their sites are being used as pivot points for fake traffic. That’s not much comfort to Sami. He says he is working with a lawyer to demand from Google for the money he believes he earned.